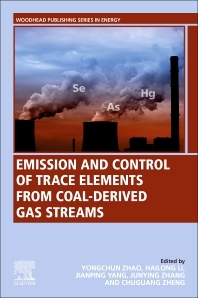 Emission and Control of Trace Elements from Coal-Derived Gas Streams presents an up-to-date and focused analysis on Trace element (TEs) emissions and control strategies during coal utilization. This book provides insights into how TE’s in coal are distributed from different coal-forming periods, coal ranks and coal-bearing regions. As the emission and control of TEs during coal utilization are a significant concern, this book introduces TEs in coal and pollution in an accessible way before discussing why they occur and how they are distributed during various stages of coal forming, also considering various regions and countries. Specific types of TEs in relation to partition in coal combustion, coal fires, gasification and coal feed furnace are then analyzed, providing the reader with practical knowledge to apply to their own research or projects. This book is an essential reference for energy engineers researching and working in coal technology, with a specific focus on emission control, as well as graduate students and researchers in energy engineering, environmental, thermal and chemical engineering who have an interest in trace element emission and control from coal utilization. Zhao is Associate Professor of Energy and Environmental Engineering and Vice Director of State Key Lab of Coal Combustion, Huazhong University of Science & Technology, Wuhan, China. He is a Member of RSC, ACS and TSOP. He was the recipient of the Guangdong Province Science and Technology Progress Award for his contributions to the field of pollutant control from coal-fired power plant in 2015. His research interests are trace elements partition, release, retention, and its potential as a resource. He is the Principal Investigator of several projects supported by National Natural Science Foundation of China (NSFC), National Basic Research Program of China (973 Program), etc. He has published more than 60 peer reviewed journal papers as the first author or corresponding author. Jianping Yang is an associate professor at Central South University. He received his Ph.D. degree in Thermal Engineering from Huazhong University of Science & Technology in 2017. His main research interests includes emission and control of trace elements mercury during coal utilization, oxyfuel combustion, CO2 utilization, photocatalytic pollutant removal. He has published more than 20 SCI journal papers and 2 books regarding oxyfuel combustion and mercury emission and control. Professor Junying Zhang is the deputy director of State Kay Laboratory of Coal Combustion, Huazhong University of Science & Technology, New century talent of Hubei province(2002), the principal investigator of National Basic Research Program of China (973 Program). He is the editor member of Coal Chemical, the member of ICCP, IMGA. His research interests are, at present, focus on Clean coal technology, Emission and control of pollutions during coal combustion (trace elements, Hg, PM), CO2 sequestration, Hydrogen production, etc. He is the Principal Investigator of five projects supported by National Natural Science Foundation of China (NSFC), two 973 Program and two 863 project. Professor Zheng Chuguang is now a professor and Ph.D supervisor at Huazhong University of Science and Technology. He is the Director of Advanced Coal Technology Consortium, China-US Clean Energy Research Center. Professor Zheng has been involved in the development and theoretical study of coal combustion technology for a number of years. In acknowledgement of his efforts in research and development, He has received numerous awards, including second place in the National Award for Natural Sciences twice (2002, 2014), awards of Scientific and Technological Progress by the State Ministry of Education, and five first place awards at the provincial level.